This entry was posted in How To and tagged Edit Mp3 tags, How to create and edit playlist, How to normalize file to a specific volume, How to submit lyrics to Zortam music database, remove mp3 tags, Rename files using mp3 tags, Write tags from filename on February 9, 2016 by Zortam Support. This entry was posted in Zortam News and tagged Edit Mp3 tags, How to create and edit playlist, How to normalize file to a specific volume, How to submit lyrics to Zortam music database, remove mp3 tags, Rename files using mp3 tags, Write tags from filename on January 30, 2016 by Zortam Support. Just select files and drop them to the playlist. 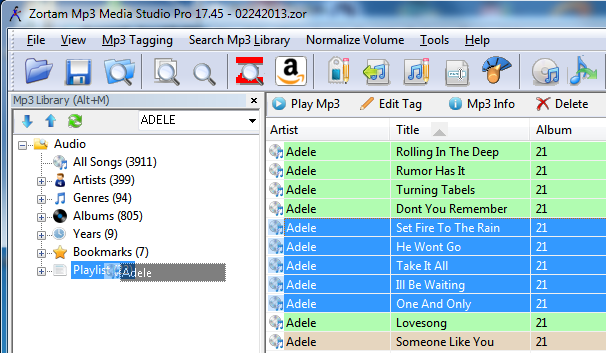 You can also select files and press Crtl+Alt+S to save files to playlist. To edit song order in playlist select playlist mouse right click menu “Manage Playlist” or press Ctrl+Alt+M. This entry was posted in How To and tagged How to create and edit playlist on December 22, 2014 by Zortam Support.